Experience the luxury that Bella Riva #203 has to offer. Prepare wonderful meals in your fully-equipped kitchen and enjoy soaking in the Jacuzzi tub in the Master bathroom. 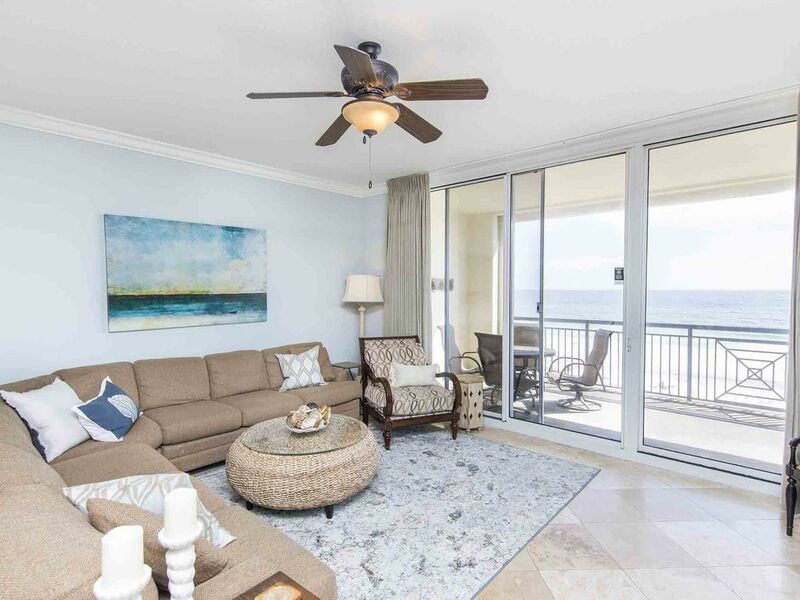 This four bedroom Fort Walton Beach condo accommodates up to ten people, wonderful for families or friends traveling together. Enjoy relaxing on your oversized balcony overlooking the shimmering blue waters and take in beautiful sunsets. For a bit of exercise you can take a walk along the shoreline or take advantage of the fitness facilities located at Bella Riva. Enjoyable vacation and beautiful accomodations! Hi Cheryl! Thank you for your review! We are happy to hear that you enjoyed your stay! Come back and see us again next year! It's a great location and built-in appliances are top-notch but there were a number of issues related to maintenance. The towel holders and toilet paper holders feel of the wall regularly and the carpet and rug need, if not replacement, a *deep* cleaning. However, we did love the large, commodious patio with a nice gas grill; sat out there quite a bit as we had rain regularly. Thank you for your review and feedback. We are glad to hear you had a great experience. We did have our maintenance team repair the items mentioned. We hope that you come back next year for another memorable vacation! Beautiful Condo with Everything You Need! The pictures don't do this place justice! Beautifully decorated and well maintained condo with picture perfect views! Pool and hot tub are at the other end of the building so it's quiet and peaceful on the balcony. Kitchen has top of the line appliances and is stocked with everything you could possibly need. This was our third trip to Okaloosa Island and this is the largest, most beautiful unit we have stayed in yet. Don't hesitate to book Bella Riva #203 for your next vacation stay! No one gives weather refunds. Airlines don't. Hotels don't. Ski mountains don't. Campsites don't. You booked a beach vacation during hurricane season, and you probably booked it at a huge discount because of that very reason. Despite the fact that you obviously have no knowledge of how hurricanes actually work, you rolled the dice. Well guess what, Ron. You lost. Get over it and move on. The unit was beautiful…fully stocked kitchen, spacious living, and gorgeous view of the ocean. However, we were only able to enjoy the unit for 2 days until Hurricane Isaac chased us out. We were warned by local residents and local news about roads washing out, bridges (escape routes) being closed due to high winds, tornado watches, impending power outages, and storm surge conditions in the Okaloosa Island area. Our rental unit was located on the first floor right on the beach. We contacted the rental agency, Southern Resorts, multiple times, but they were very unresponsive and did not return calls. We asked that they contact the owners of the unit to see if see if we could reschedule our vacation or move to another Southern Resorts condo further inland. Phone calls were not returned. Even when we visited Southern Resort’s office twice on Okaloosa Island, the agent on duty was aloof and gave us his “rubber stamp” response about “not our policy.” With a 4-year old granddaughter and 7-month old grandbaby, we could not take the chance of staying with severe storm warnings, impending power outages, and potentially no escape path. We will never use Southern Resorts again. It is “not our policy” to reward poor service with more business. It is our policy, however, to pass on information to our many acquaintances nationwide. Thank you for taking the time to let us know how your recent vacation was. We are thrilled to hear that the condo was lovely and had everything that you needed during your stay. We are sadden to hear that Hurricane Isaac had paid a visit during your well deserved vacation and your vacation was shortened. We know how scary it can be for our out of town guests to hear that there is a storm that may be headed to our area and the potentials that it may have. Our area does not take these storms lightly and each county looks carefully at the path of the storms to decide if a mandatory evacuation is necessary. Thankfully, the storm was not on path to directly impact Okaloosa Island, resulting in no evacuation. The beach was closed for safety of all tourists and locals for a couple of days, but was quickly reopened for everyone to enjoy. We know that each guest has to make a decision that is best for their family and we do understand the reason that you decided to leave. I apologize that you feel Southern did not take the actions that you requested for a refund or to reschedule your vacation, however, if it would have been an evacuation, we would have been able to honor your request. We hope that you will reconsider staying with Southern Vacation Rentals once again and we look forward to the opportunity to have you as our guest.